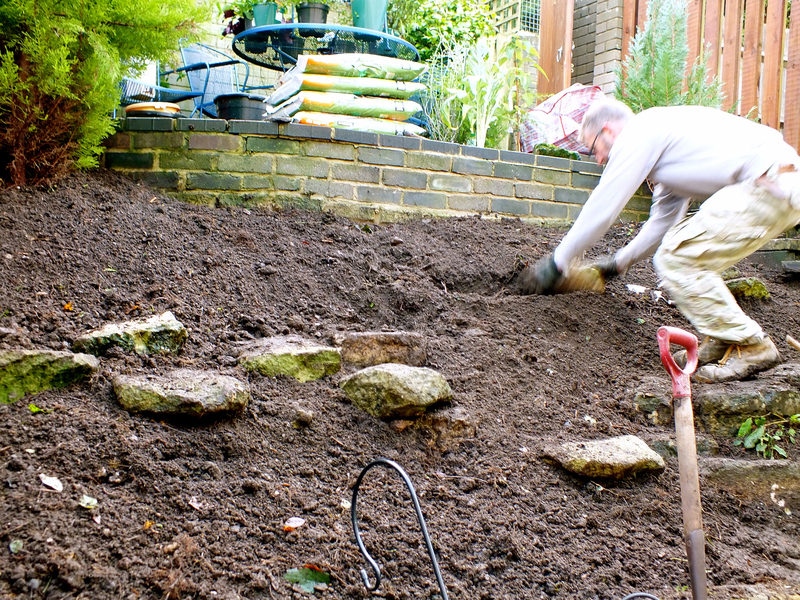 The soil is clay-based with pockets of added compost from previous plantings, plus some deeper-seated building debris. The planting area has a severe slope to the north of about 25° (see drawing 2) that threatens plant establishment and stability, and the terracing has made significant inroads into the available planting area. Most of the existing plants had grown unchecked and were leggy and misshapen; their flowering and vigour had progressively diminished and access for training or pruning was extremely difficult. 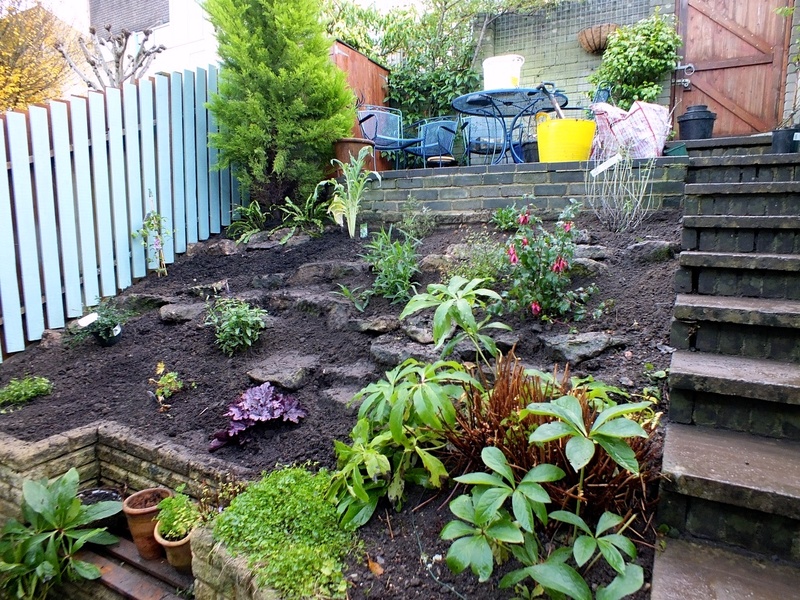 I had intended to judge each shrub/plant on its merits, but very soon it became clear that very few of them were worth keeping – it seemed heartless as the disposal heap got ever bigger but there was no room for sentimentality. Some hellebores and bulbs deserved being kept and were included in the makeover. 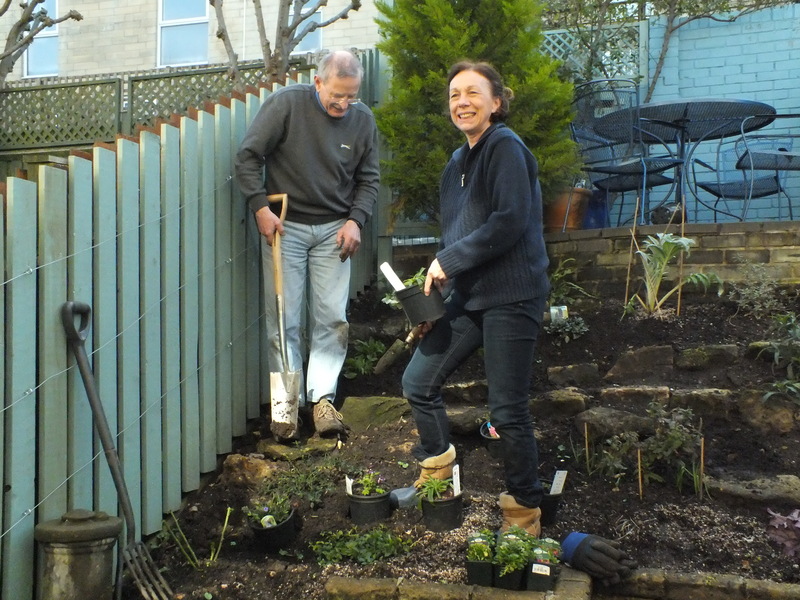 Once the plants had been cleared some additional rocks had to be set in the ground both to stabilise the sloping soil and to provide safe access for attending to the plants. 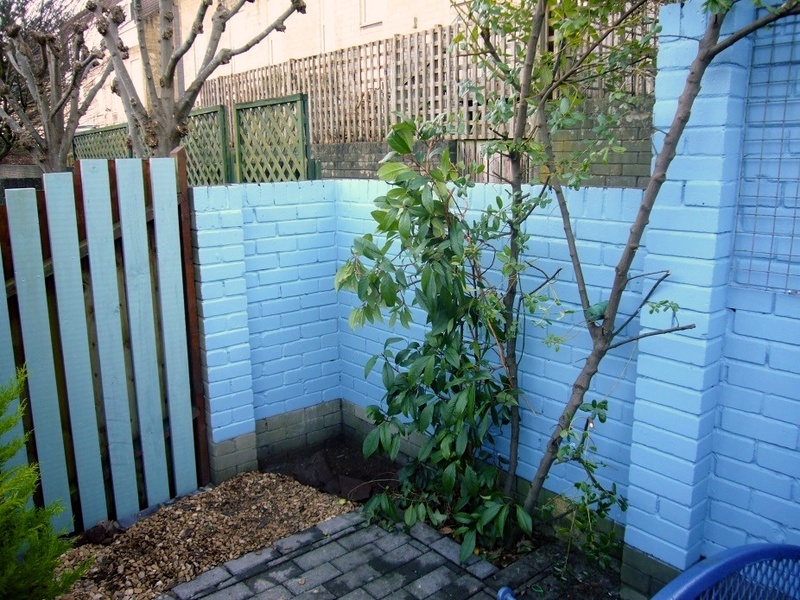 After agonising over colour charts, I decided on Cuprinol ‘Sea grass’ for the fences and Dulux Weathershield ‘Stonewashed blue’ for the walls. 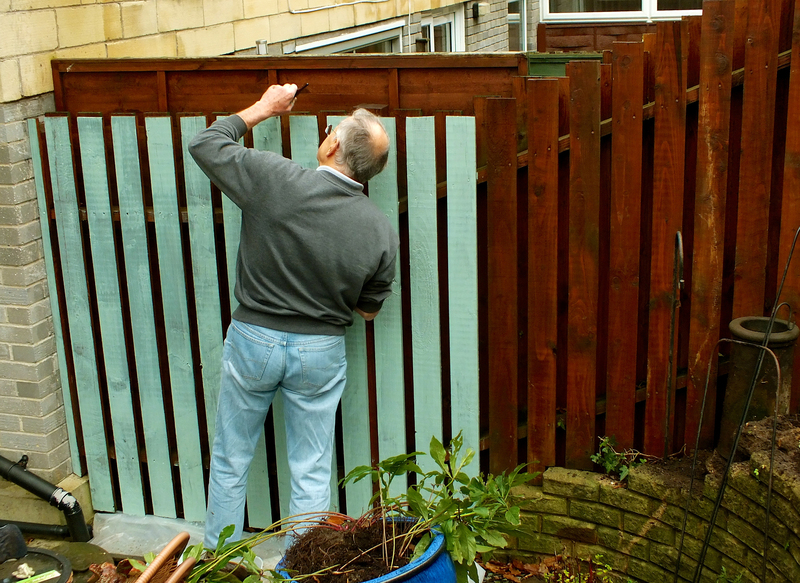 The fence was wire brushed and painted with three coats. The walls with their heavy algae growth had to be additionally soaked with a bleach solution. The transformation was instant! Now it was time for the really fun part – choosing and buying the first batch of plants. With plenty of expert help and suggestions from both Stewart my trusty garden advisor and my green-fingered mum, I trawled through catalogues and websites looking for plant types that would appeal to bees and butterflies, would be happy with the prevailing conditions, and wouldn’t grow too tall, too wide or too leggy. The first batch of plants is in situ! Then it was off to the Garden Centre – here mum came into her own again by funding the first plant batch as an early Christmas present. Once the initial plants were in (see planting list), the last major job was to prepare the base and build the new arbour on the upper terrace. After a dull, cold and largely uneventful January in the garden, by mid February it was time to start thinking about another visit to the nursery for the second and –for now – final batch of plants. 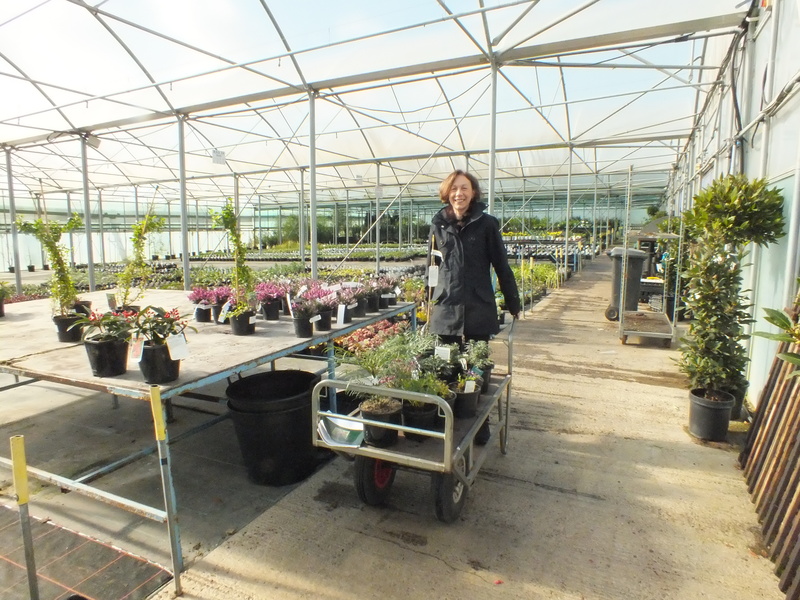 At the the beginning of March when most nurseries were well stocked with exciting new season plants, Stewart and I set off for Downside and Atworth nurseries on a mission. A great day’s work. 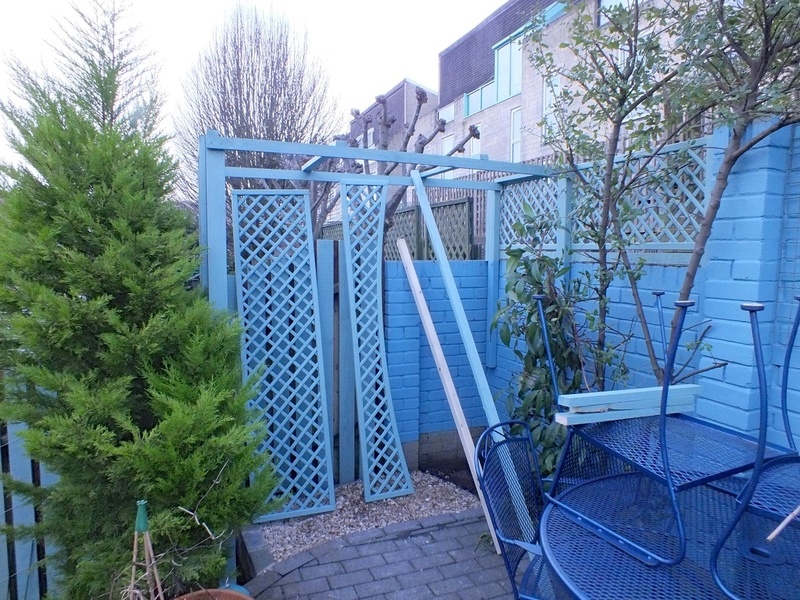 To completely restock the garden with new plants – apart from the tree, the Christmas roses and a few ferns – has cost in the region of £400. I‘ve learned there’s more to planting out than just digging a hole and hoping for the best. 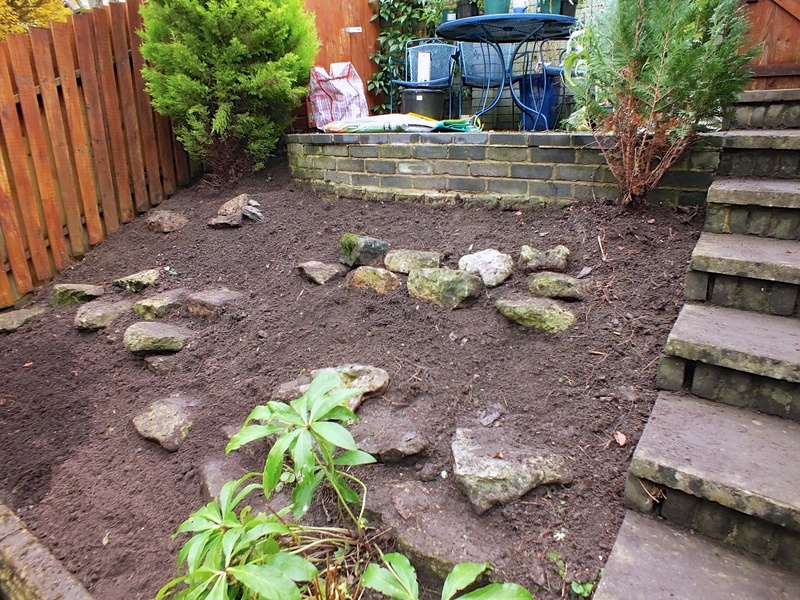 The rockery plants and alpines I hope will thrive in and around the flat stones need grit, grit and more grit. 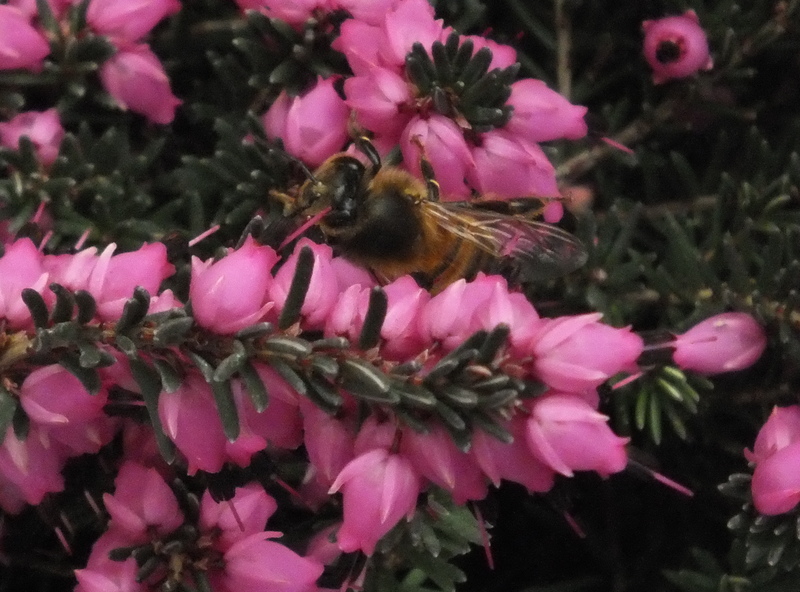 Even as were planting, a first guest was already sampling the new heather.